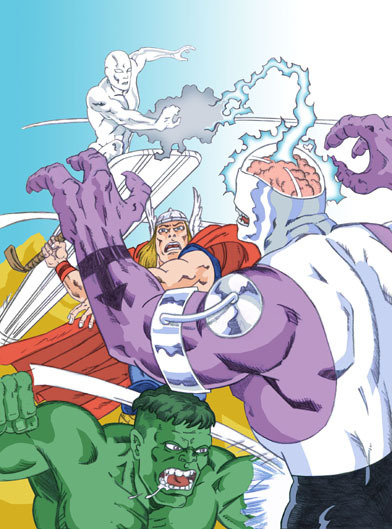 At first it was just a simple sketch of a battle between the Silver Surfer and Validus, but with room to spare Hulk and Thor joined the fray… PC colored. SILVER SURFER :D this is a really good drawing! I admit I don't know who Validus is, but this is one awesome looking fight! Looks like it's going to take those Mightiest Marvel's and then some to take that guy down! Great colours and superb composition. Looks like Hulk is seriously pissed that there is someone bigger than him. He's hitting below the belt here. Seems like it “Beserkian”. Actually, Validus is alot taller and has gone toe to toe with Superman…so like the Hulk I’d strike below the belt too! I do agree "luckylace222", the Silver Surfer’s cosmic back-lash can be a bit mind numbing even if you are Validus!